Tropical Cyclone Marcus was moving along the northern coast of Australia when the VIIRS instrument that flies aboard two different satellites captured true-color images of the storm over two days. 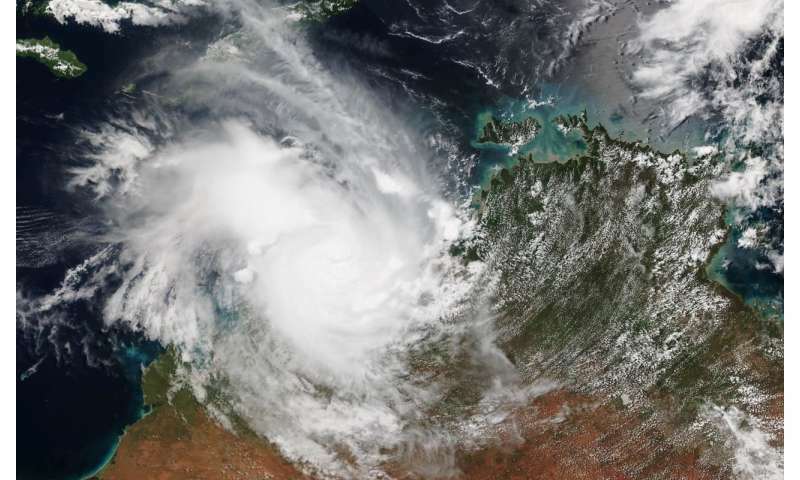 Marcus moved through Darwin, Australia on Saturday, March 17 causing power losses, downing trees and dropping heavy rainfall. Marcus brought hurricane-force wind gusts to Darwin. On March 18, 2018 the Visible Infrared Imaging Radiometer Suite (VIIRS) instrument aboard NASA-NOAA's Suomi NPP satellite captured a true-color image of Marcus. According to the Joint Typhoon Warning Center, at the time of the image Marcus was centered approximately 146 nautical miles north of Broome, Australia. On March 19 at 1 a.m. EST (0500 UTC) the VIIRS instrument aboard NOAA's NOAA-20 satellite showed Marcus' center just off the coast of the Dampier Peninsula, Western Australia. The VIIRS image showed bands of thunderstorms wrapping into the center extended toward the north over the Southern Indian Ocean and toward the southeast over Australia's Northern Territory. 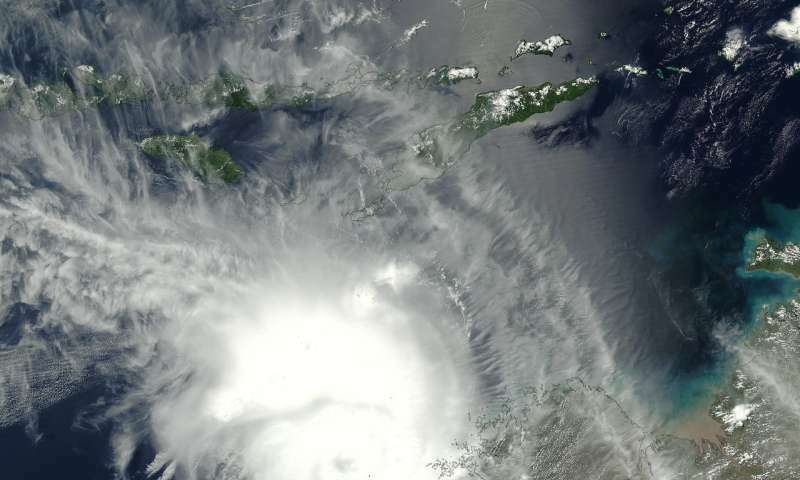 The VIIRS image also revealed a cloud-filled eye. True-color imagery is created by combining data from the three color channels on the VIIRS instrument sensitive to the red, green and blue (or RGB) wavelengths of light into one composite image. Data from several other channels may also be included to cancel out or correct atmospheric interference that may blur parts of an image. By 11 a.m. EST (1500 UTC) on March 19, Marcus continued moving away from the Kimberley coast. The Australian Bureau of Meteorology or ABM noted there is no further threat of gales on the coast. Marcus had maximum sustained winds near 80 mph (70 knots/130 kph). It was centered near 15.5 degrees south latitude and 121.2 degrees east longitude. That's about 130 miles/210 kilometers west northwest of Cape Leveque and 183 miles/295 kilometers north northwest of Broome. Marcus was moving to the west at 16 mph (14 knots/26 kilometers) per hour. NOAA-20, designated JPSS-1 prior to launch, is the first of NOAA's latest generation of U.S. polar-orbiting, non-geosynchronous, environmental satellites called the Joint Polar Satellite System. NOAA-20 was launched on November 18, 2017 and joined the Suomi National Polar-orbiting Partnership satellite in the same orbit. ABM forecasters noted that the "heavy rain over the coastal northwest Kimberley will ease as Marcus moves further away." Flood Warnings are current for the Kimberley, please see http://www.bom.gov.au/wa/warnings for further details.